In Manchester United’s glorious 115-year existence, the club has never been at just the right levels of not good enough to qualify for the Champions League, good enough to make it to and play well in the Europa League, and desperate enough to believe that trying to win Europe’s second-rate tournament would be worth a damn. That all changed this year, when it was clear for months that their best chance of making the Big Dance next season would be by winning the Little Dance. And they’ve done it. Hooray. This Europa League final pitting United against Ajax was just as boring as most José Mourinho-managed big games tend to be. United got an early lead through a deflected Paul Pogba shot in the 18th minute, spent the majority of the rest of the match swatting away Ajax’s attractively orchestrated (though ultimately not very threatening) attacks, and more or less cruised to victory. Henrikh Mkhitaryan doubled the Red Devils’ lead just after halftime from a corner kick, and the second half was even less eventful than the first. The boringness of the match obviously doesn’t and shouldn’t bother United though, since the victory was all they were after and they got it. United had a weird season. With really good players like Zlatan Ibrahimović, Pogba, Mkhitaryan, Eric Bailly, Antonio Valencia, Ander Herrera, Juan Mata, Anthony Martial, and so on and so forth, they really should’ve done better in the league than they did. They probably wouldn’t have won the title even under the best of circumstances, but at the very least they had enough talent on the roster to make a stronger push for the Champions League places. United’s relative underachievement was facilitated in part by Mourinho’s reluctance to commit to lineups and systems that would showcase his best players (like playing Pogba in a 4-3-3, or playing Mkhitaryan at all). If all United had to show for their season was a sixth place finish in the league, more Europa play next year, and open questions about whether Mourinho was the right man to lead this young, attacking group going forward, it would’ve been a very bad year. Luckily for the club, this wasn’t the case. Because of the UCL place they just won, United will probably be able to close the three or four more signings they’ll need in order to amass a legitimate title-contending squad. For instance, there’s now no real reason why Atlético Madrid’s star striker Antoine Griezmann wouldn’t want to join up with his buddy Pogba in Manchester, and he is the kind of player that can push this team from pretty good to terrifyingly great, as Atlético’s recent success shows. With a couple more key signings and a clearer idea about how Mourinho wants to utilize all the talent at his disposal, United should be really really good in the years to come. 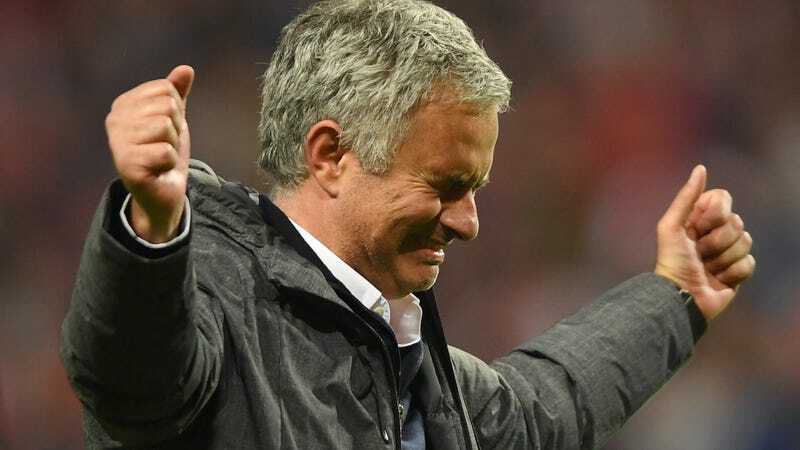 Thus, even if it was kind of funny to see highly decorated players like Ibrahimović and Michael Carrick and Wayne Rooney and Valencia feign excitement over a trophy that only matters to United because of the trophy it allows the club to compete for next season, and even funnier to see a weepy Mourinho earnestly celebrate victory in a competition he has openly slighted during the rosier patches of his career, coming away with a win today really was a big deal. Let’s just hope this isn’t truly the end of the LOLUnited era.